Last night after I made my post, I got out my glue and went to work on putting the Humpty Dumpty flower back together again. It was a new tube of Krazy Glue and I had only used the tiniest bit, so I squeezed and squeezed until the glue broke loose. And ran down my hand as to not pour all over the place. I glued my fingers together. 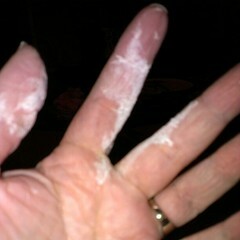 Thankfully, I pulled them apart before they really stuck, but this shows the glue all over my hands. I tried nail polish remover pads (I didn't have a bottle). I tried vegetable oil per one suggestion I got. Finally, I got enough off to bend my pointer finger, but I'm still picking off pieces from my fingers. To top that, what I glued didn't stay glued and I'm going to have to try again. And get the green duct tape that's in my dad's garage. That ought to fix it. And if that weren't annoying enough, I ended the night by pulling loose two crocheted rows of my baby blanket because I finished a row wrong and I wasn't coming out right. At least I didn't glue my crochet needle to my hand. It wasn't my crafty night.